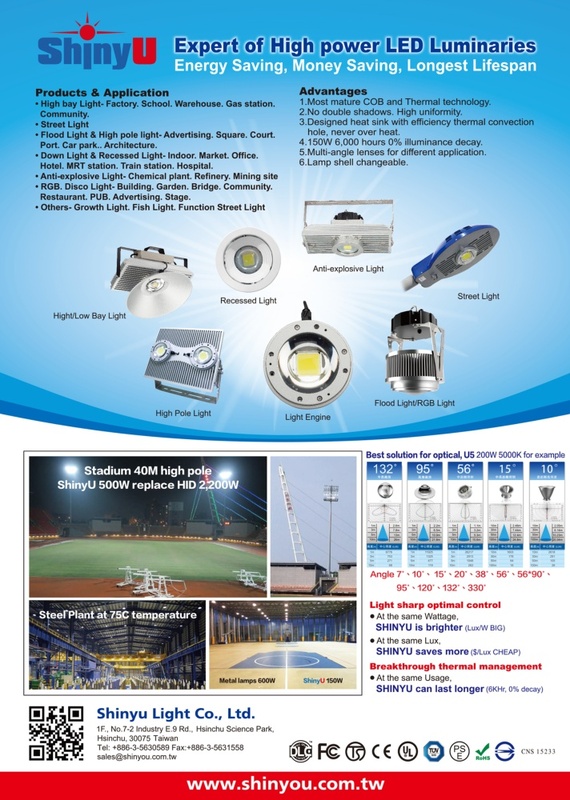 Founded in February 2010, Shinyu Light specializes in the R&D, design, manufacture and branding of a wide variety of energy-saving and environmental-friendly LED lighting fixtures and has an excellent management and R&D team led by GM Xie Dongjie. Shinyu Light has also obtained patents for comprehensive applications and inventions. Due to the special properties of LED, well-designed cooling solutions can effectively extend the lifespan and increase the luminance of LEDs. With the rise of the concept of energy conservation, our R&D team has made cooling technology as the prime target, in order to develop more and better LED lighting fixtures through increasing effort. With the new technologies developed, we will produce more energy-saving and environmental-friendly lighting fixtures, in order to bring people a more comfortable environment and a green lifestyle. 	The optimal light distribution curve design (non-aging glass lens) have an integrated single point light source which effectively controls light shape with no ghosting, uniform illumination, and no waste of light. 	Unique LED package and die bonding technology provides ultra-low thermal resistance, die bonding technology, fast thermal conductivity, and high reliability. 	The lighting engine is modular, lightweight, miniaturized, and has better heat dissipation. Heat sink fins can be made lighter and smaller. 	Flexible shape design makes heat dissipation module smaller and matches various existing lamp designs. 	Simple mechanism, less failure, IP68 protection grade, and durable competitive maintenance cost can improve investment efficiency.